The boost in popularity enjoyed by SUVs over the last few model years have made the segment more crowded and competitive than ever before. And that means new SUVs have to do more, offer more, and feature more than ever before in order to stand out above the rest of the pack. 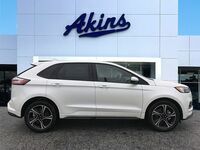 And no other new SUV has done more to stand out above the rest of the pack than the all-new 2019 Ford Edge lineup at Akins Ford near Atlanta, GA.
That’s because the all-new 2019 Edge lineup has been fully revamped to be more powerful, more capable, and more fun to drive than any other SUV available today. 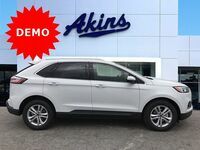 The 2019 Edge lineup also offers more trim levels than ever before thanks to the all-new 2019 Ford Edge Titanium Elite and the all-new 2019 Ford Edge ST – the first Ford SUV engineered by the Ford Performance Team. So, let’s see just how far ahead of the pack the all-new Edge lineup is with this 2019 Ford Edge versus 2019 Chevrolet Equinox model comparison. 250 HP & 280 lb-ft. Standard Horsepower & Torque 170 HP & 203 lb-ft.
335 HP & 380 lb-ft. Max Available Horsepower & Torque 252 HP & 260 lb-ft. 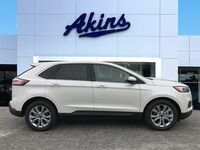 While safety, connectivity, and gas mileage are incredibly important to SUV shoppers – and are three areas in which the 2019 Edge lineup truly excels – the two most important categories for SUV shoppers are power and interior space, which just so happen to also be two areas in which the 2019 Edge lineup excels. In fact, the 2019 Ford Edge lineup is far more powerful and spacious than the 2019 Chevy Equinox lineup – as outlined in our comparison table above. As you can see in the table, the standard engine of the 2019 Edge lineup is more powerful than the standard engine of the 2019 Equinox lineup, while also being a couple horsepower away from being more powerful than the most powerful available engine for the new Equinox lineup. The 2019 Edge lineup also features more passenger space and more cargo space than the 2019 Equinox lineup. 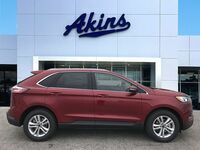 For more on all the ways the 2019 Ford Edge lineup is superior to all other SUV options in its class, please contact our staff here at Akins Ford near Atlanta, GA.